National leader of the All Progressives Congress, APC, Asiwaju Bola Ahmed Tinubu, is progressively asserting his supremacy in the affairs of the party and by extension the in-coming government of General Muhammadu Buhari, through a combination of factors. The principal factor is his mastery of the art of politics, which has seen him welding together strange bedfellows to achieve the common goal of defeating the incumbent Peoples Democratic Party, PDP, government of President Goodluck Jonathan. The former governor of Lagos state has, through development of this delicate art been able to outmaneuver other political forces like former Minister of Foreign Affairs, Chief Tom Ikimi, former Vice President, Alhaji Abubakar Atiku, the one-time formidable chieftains of the Yoruba socio-cultural and political group, Afenifere and one of his godsons, outgoing Governor Babatunde Fashola of Lagos state. More recently, Tinubu has been engaged in a battle of wits with Senator Bukola Saraki, former governor of Kwara state over who occupies the position of the Senate President and with Hon. Yakubu Dogara over occupancy of the seat of Speaker of the House of Representatives, and there are strong indications that he will also have his way. 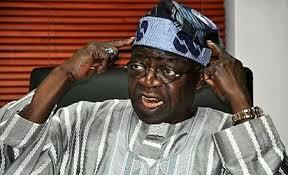 The complex political engineering that went into the merger of political parties, especially, the Action Congress of Nigeria, ACN, the Congress for Progressive Change, CPC, the All Nigerian Peoples Party, ANPP and factions of some other parties like the All Progressives Grand Alliance, APGA saw Tinubu always emerging on top. For instance, when the issue of who would occupy the strategic position of party Chairman came up, there was a lot of uproar, involving individuals like Chief Ikimi, who, when they were outmaneuvered by the Jagaban, left the APC frustrated. When the issue of nomination of a presidential candidate for the party came up, again, it was as though there would be major crisis, especially as Alhaji Atiku who was seen as a very bright prospect fought on till the last ballot was counted at the primaries which was strategically held in Lagos. When Atiku was pronounced the loser and Tinubu’s candidate, Buhari was endorsed by the delegates, it was rumoured that Atiku would leave the party but again, the alchemist went to work and thereafter, the Adamawa state-born billionaire stayed on to help deliver Buhari at the presidential polls. The battle shifted to the choice of running mate for Buhari, and it was, indeed, a tough battle with the likes of Rivers state governor, Rotimi Amaechi, Babatunde Fashola of Lagos state, Edo state Governor Adams Oshiomhole and former Ekiti state Governor, Dr. Kayode Fayemi seen as frontrunners. The whizkid swung into action again and by the time the thick dust raised had settled, his protégé, Professor Yemi Osinbajo had emerged as the generally accepted Vice Presidential candidate . Many had thought that the incumbency factor enjoyed by the PDP, the vicious hate campaigns against his person and against Gen. Buhari would work against the APC, but when the results started trickling in, it was evident that the Tinubu magic had worked again. Today, the burning issues are who would be Senate President and Speaker of the House of Representatives. The scarcely hidden fact is that Tinubu is rooting for Senator Ahmed Lawan from the North East geo-political zone and Hon.Femi Gbajabiamila from the South West zone for Senate Presidency and Speaker respectively. Senator Saraki is still coveting the Senate presidency and groups in the North Central zone and some past and present governors are working for the the actualisation of his dream while Hon.Dogara still hopes to be Speaker, but unless something major happens, every indicator points to the fact that Tinubu would again have his way. His word is gradually becoming law in the APC and it is believed that he would have a strong influence on the incoming government, especially as concerns who would be minister and in which ministries. Apart from his ability to identify and present generally acceptable candidates for positions, the one-time Senator and chieftain of the Gen. Sani Abacha – era National Democratic Coalition, NADECO, is famed to be stupendously rich and knows how to deploy his resources to achieve his goals. Besides, early in his political career, he understood the power of the media and apart from setting up some platforms of his own, has mastered the art of mobilising the media organisations that are not even part of his business empire to support his usually masses oriented campaigns. He is also seen as humble and down to earth , to the point that the man on the street often identifies him as one of their own, one who fights for the masses. A man who is close friends with Presidents of other countries in Africa and beyond, it is not yet clear where his political trajectory is headed, but one thing is clear, it is in ascendency.